A gold medal from the 1997 International Chemistry Olympiad in Montreal, Canada. On 10 July 2007, IUPAC President Bryan Henry signed a Memorandum of Understanding with Manfred Kerschbaumer, chairman of the Steering Committee of the International Chemistry Olympiad (IChO), to formalize IUPAC’s support for IChO. countries that cannot travel with two mentors. The unused portion of any grant will be provided to next year’s host. In future Olympiads, the IUPAC president (or his or her nominee) will be invited to speak at the closing ceremony of the IChO and to take part in the gold medal presentations. Financial support will begin for the 40th IChO in Budapest, Hungary, in 2008. 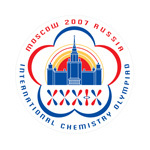 From 16–23 July 2007, Moscow hosted the 39th International Chemistry Olympiad, which gathered together 256 high school students from 68 countries. This Olympiad was the third one to take place in Moscow: In 1972 only 7 countries participated, while 45 participated in the one held in 1996. The opening ceremony took place in a square at M.V. Lomonosov Moscow State University. The participants were welcomed by V.N. Fridlyanov, deputy minister of Education and Science of the Russian Federation, the president of the Olympiad; V.A. Sadovnotchi, rector of Moscow State University; and V/V/Lunin, dean of the faculty of chemistry. The parade of countries was followed by a concert and fireworks. The program of the Olympiad consisted of experimental and theoretical problems. The tasks were prepared by members of the Scientific Committee, led by professor V.V. Eremin. As the participants and their coaches commented later, the complexity of the tasks was unprecedented. The theoretical portion of the exams included problems dealing with practically all fast-developing branches of chemistry, including proton tunneling in propane-dial, catalysis with nanoparticles, theory of autocatalytic reactions, the Fisher procedure of water titration, silicates as the basis of the Earth crust, arthrosclerosis treatment, and intermediates of the biosynthesis of cholesterol. The experimental portion of the test were no less interesting. The problems took two days, and during the free days the students visited many interesting places in the Russian capital, including a boat ride on the Volga River; the ancient city of Sergiev Posad, where one of the most famous Russian monasteries, Troitse-Sergiev Lavra, is located; the Moscow Zoo, and the circus. Participants made a lot of friends and became acquainted more thoroughly with Russian history and culture. —a quote from Roald Hoffmann that appeared in Catalyzer, the daily newspaper produced by the Olympiad. The total number of awards was large: 60 percent of participants received an award of some type. The following medals were awarded: 31 gold, 56 silver, and 71 bronze. Splendid results were achieved by the teams from China, Russia, and Poland—every member of these teams received a gold medal. The South Korean team received three gold and one silver medal. Among the gold medal winners were students from Germany, France, Vietnam, India, Lithuania, Taipei, Thailand, Turkey, Slovakia, Hungary, Canada, and Iran. The gold medal winners with the four highest results were Lei Xu and Yuan Fang of China and Leonid Romashov and Vasiliy Vorobyev of Russia. As the history of the Chemistry Faculty of MSU manifestoes, the future scientific career of the winners is optimistic. Many of them enter MSU and later on become the members of the Olympic movement as the coaches, authors of the tasks, or members of the organizing committees. Just one example: the coach of the Russian team Alexei Zeifman was the absolute winner of the 2004 and 2005 Olympiads, another coach, Alexandre Belov, got the gold medal in the year 2003. A student conducts experiments for the practical exam portion of the Olympiad. The closing ceremony took place in the Act Hall of MSU. The winners received awards from the hands of members of the Russian Academy of Science, representatives of chemical business, and the representative of IUPAC. After that, the concert gathered together the stars of the Bolshoi Theatre and the young winners of the prestigious musical competitions. The Olympiad would not have been possible without the generous sponsorship of the government of the Russian Federation and the following chemical companies: Tokyo Boeki, Lykoil Neftekhim, Base Element, and Potanin’s Charity Fund.